With a religious origin, it's where they celebrate the San Miguel festivities. It's the seafront promenade of the Bajondillo district that extends along one kilometre with plenty of 'chiringuitos' (beach bars) to sit down and have something to eat or drink. It extends up to the Plaza del Remo, and has 'chiringuitos' and restaurants where one can enjoy the fried fish and seafood, ice cream parlours and souvenir shops. It's situated in the interior of an early 19th century building in La Cruz Street, formerly known as College of Orphans of the Railwaymen. It reopened in 2001 and the original construction is of around 1929. If you go to the fair, you'll visit this area. The fairground also hosts the Sports City and the Municipal Auditorium. Every Thursday and Sunday a flea market is held there, with plenty of second hand items. One of the most important spring fountains in Andalusia, situated in the upper part of Torremolinos, El Pinar de los Manantiales, near the Mill of Inca. A big building where all kinds of events and exhibitions are held, from technological innovations to gastronomic festivities. The symbol of Torremolinos, erected in the early 19th century to protect the coast by the Arabs and by the Christians after the conquest. 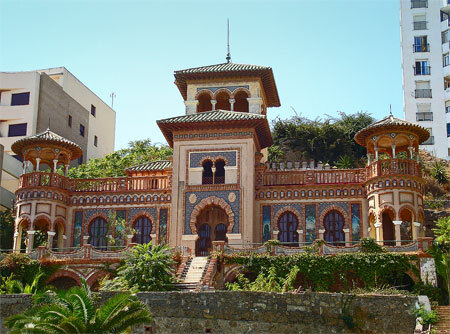 Moorish style palace with sea views situated in the Playamar area. Ordered to be built by Antonio Navajas Ruiz in 1925. It's now part of the patrimony of Torremolinos. A peculiar museum of the art of tattooing the skin...it may not be considered cultural, but the visitor will certainly find it interesting. A pedestrian and commercial street, situated in the centre of Torremolinos, it's the central axis of the municipality. It has all kinds of shops, from jewellery stores to shoe shops, fashion and from its ramifications there is access to restaurants and bars. The Torremolinos train station is also situated next to the San Miguel street. A green area in the municipality with beautiful spring fountains and many different species of trees. There are barbecues and tables for those who want to spend a day in the countryside. There are trekking routes in the natural ecosystem of the Torremolinos Hills, between the Guadalhorce Valley and the Mijas mountain range. One of the main tourist attractions in this municipality are the beaches, with over 7 km. of beaches and a long seafront promenade, showers and the possibility of practicing many water sports. The most popular beaches are: El Saltillo, Montemar, La Carihuela, El Bajondillo, Playamar and Los Alamos.